Angourie Rice, Justice Smith, Jeni Ross et al. 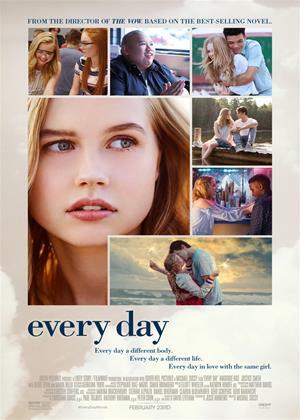 Based on David Levithan's acclaimed New York Times bestseller, Every Day tells the story of Rhiannon (Angourie Rice), a 16-year old girl who falls in love with a mysterious spirit named "A" who inhabits a different body every day. Feeling an unmatched connection, Rhiannon and A work each day to find each other, not knowing what or who the next day will bring. The more the two fall in love, the more the realities of loving someone who is a different person every 24 hours takes a toll, leaving Rhiannon and "A" to face the hardest decision either has ever had to make. A lot of young adult novels tend to come with big ideas but never explores them further, choosing more to be lost within the moment than exploring the deeper concepts of such otherworldly themes. Every Day is a tad different in that it takes the time to make its somewhat sci-fi teen romance a little more thoughtful in its idea. It never reaches its pique considering there’s a bigger social message loosely tied into its structure but perhaps the filmmakers knew that was territory too tricky to traverse for such a genre. After all, the whole objective here is to feature an unlikely romance more than question the formation of the universe and how are souls are connected. The premise is that there is a spirit who simply refers to himself as “A.” This spirit, ever since his birth, inhabits a random body every day, against his will. He has no control over which body he’ll go into next but it does seem like he always lucks out in getting teenage bodies and that the bodies are all around a high school. It is at that high school where he meets Rhiannon and he wants to be in a relationship with her. But it’s tough for a soul-jumping being to make such a scenario work properly. There’s an obvious awkwardness in dating someone different every day who is essentially the same person in a different skin. How would that work for the future? Would they have a kid together? What if A finds himself possessing people in other countries and never finds Rhiannon again? Surprisingly, these great questions are brought up by the couple as they struggle to make their relationship work and better understand the mentality of A. That’s some heavy subject matter but it’s unfortunate that story quickly recalls it’s a young adult tale and must adhere to the template. This means there’s a helping of melodrama in the teens that A possesses, with relationships that begin and end in the twisty and tangled world of never-ending possession. Also, plenty of montage with the latest light rock beats to get those teenage romance whimsies rocking. Every Day is rather frustrating in how there is so much potential with such a story and we only tap into a modicum of its perspectives. The characters are far more wrapped up in the drama of how the relationship will work than how the whole soul-jumping works or deeply moves A over time. Brief bits reveal his tragic history of just being used to the world constantly changing around him but I can’t help but feel there’s a bigger picture here than whether or not he can find the right girl before he starts possessing the college crowd. There’s obvious relation in this story to shifting of how teenagers find their place emotionally, spiritually, and sexually. Consider how Rhiannon goes along with most of A’s possessed bodies, even girls that she is willing to kiss because she knows the soul she loves is in that student. But there’s also an evasive nature that never wants to delve too deep, keeping that simpler romance always in the foreground with a bigger story in the background. I can’t fault Every Day too much for never going that extra mile. I just wish it went further. Let’s face it; the young adult genre is a low bar to cross for success but the higher bar is so close within this novel’s grasp you can taste a great teen sci-fi romance.